Fast to mature and easy to grow, beans have several characteristics that make them good partners for other vegetables. They tolerate partial shade, and most beans have tiny hooked hairs on their leaves that entrap aphids and other small insects. Beans can fix nitrogen taken from the air, so they make fewer demands on the soil’s nutrient supply compared to other vegetables. Beans also deter weeds with their dense growth both above and below the ground. How you use beans as companion plants depends on what you hope to accomplish. High-rise walls of climbing beans can be used to provide shade for neighbours that suffer in strong summer sun, while low-growing dwarf French beans can be used as weed-suppressing ground covers between rows of potatoes. Whether they grow on vines or bushes, you will need good access to beans that are harvested whole as green beans, which need to be picked every other day when the crop is ready. Dry beans, which are left on the plants until the pods dry to brown, can simply be left to grow, so they are a great option for Native American-inspired Three Sisters plantings comprised of sweetcorn, beans, and long-vined winter squash or pumpkins. Compact dwarf beans provide plenty of creative companion planting options in any type of garden. In intensive raised bed gardens, you might anchor the ends of double rows of dwarf French beans with summer savory or upright dill plants, two herbs often paired with green beans in the kitchen. Dwarf beans work well when interplanted with potatoes, which are usually up and growing by the time the soil is warm enough to plant beans. After your potatoes have been weeded and hilled, plant dwarf beans down the outside of the row. As the potatoes die back, the beans will help keep the soil shaded and cool. Or, try this companion planting idea intended to protect beans from pests. Plant dwarf beans after spring radishes, coriander or rocket, with a few of the bolting plants left behind. Radish, coriander and rocket flowers attract beneficial insects, and can help to confuse pests in search of beans. 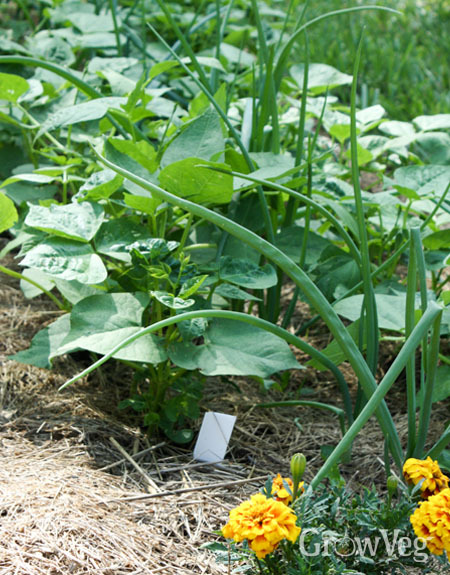 You can also interplant dwarf beans with onions to deter pests from both crops. You can use the same trellis to grow long-vined peas like ‘Sugar Snap’ with scarlet runner beans or a vigorous climbing French bean like ‘Kentucky Wonder’. In spring, plant the peas on the north or east side of an upright or A-frame trellis, and then plant climbing beans on the opposite side a month or so later, after the peas are at least 8 inches (20cm) tall. When the weather warms in early summer, the peas will benefit from shade provided by the beans. After the peas are picked, the vigorous beans will quickly overtake both sides of the trellis. Climbing beans provide direct benefits to beetroot, celery, lettuce, broccoli, cabbage and other cool-season crops when situated so that the beans shade the other vegetables from late afternoon sun. 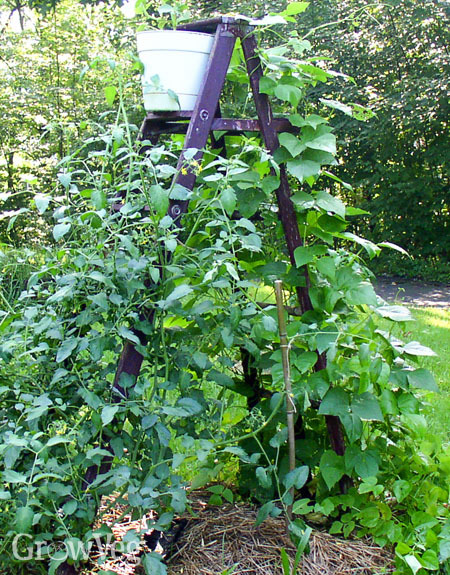 Where space is tight, some gardeners interplant climbing beans with cucumbers or tomatoes on a shared trellis. This scheme works best when the tomatoes are well established by the time the beans are planted. If you grow sweetcorn, you have ready-made trellises for a late planting of climbing beans. After the sweetcorn has grown about a foot high, plant climbing beans at the ends of the rows, and use beans to fill gaps in the corn rows, too. The beans will twine about halfway up the cornstalks by the time the sweetcorn is ready to pick. The beans will then scramble up and between the failing cornstalks, creating a hedge of heavy-bearing beans. Marigolds have a reputation for protecting beans from pests, but studies have not observed fewer leaf-eating pests on beans grown with marigolds. However, it does appear that some bean varieties do grow better in the company of marigolds, which share beans’ liking for vibrant interactions with soil microbes. French researchers have identified over 112 strains of beneficial bacteria in bean root nodules, which may be one reason why beans respond so well to small amounts of vermicompost added to the soil, and to the close company of compatible plants. "As far as I know beans and onions are NOT a good match as companion plants as they should affect each others growth. Did you try it yourself? You mentioned anything?" "Most plants that don't get along have spatial issues with one another, competing too much for sun and soil resources. With adequate spacing, bush beans and onions are happy companions. "